Me: Any ideas for new foods to try soon? Husband: How about some salads? Those of you who know my sweet husband are aware of his being a, for the most part, meat-and-potatoes kind of guy. So imagine my surprise at this response. Granted, I had just served him the heaviest, most artery-clogging (but worth it), delicious salisbury steak the night before. You don’t have to tell me twice! 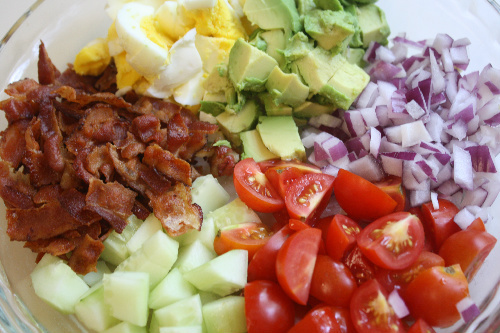 A cobb salad is essentially a bunch of ingredients separated out on top of lettuce. Usually featuring gobs of bacon and eggs. I totally didn’t know this before. I thought a cobb salad was a type of salad sort of like chicken salad. Or waldorf salad. Or, maybe I didn’t know what cobb salad was at all. This is pretty much the best salad ever. 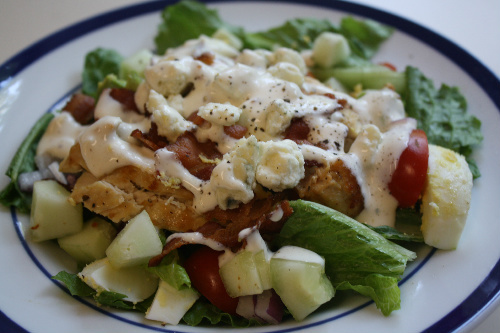 Add to a gorgeous array of toppings the garlic ranch dressing, and you’ve got yourself a delicious little dinner or lunch. Did any of you see that episode of Modern Family where Claire gets so mad at Phil when she had suggested for months that he try a cobb salad, only to have him try it at a friend’s suggestion? Then, he manages to completely forget that his wife was the one who suggested it, giving full credit to the friend. That is so me and Dave with my many, many suggestions that we watch the British masterpiece, Downton Abbey. Husband: Hey, my friend Sara suggested we watch Downton Abbey! And she has good taste, so we should watch it soon. Make large bowl of just the lettuce. Organize all salad toppings around a large pie plate (more or less of each ingredient depending on personal preferences). Make individual plates with lettuce, followed by toppings, according to preference. Top with desired amount of dressing and serve. Mix all the ingredients together. Feel free to add some milk (maybe 1/4 cup or so) because it is thick with just the buttermilk. Alternatively, you can use 1 cup of mayo and 1 cup of milk. If possible, allow dressing to set for at least an hour in the fridge. This entry was posted on Monday, July 9th, 2012 at 3:45 pm and is filed under Entrees, Salads. You can follow any responses to this entry through the RSS 2.0 feed. You can leave a response, or trackback from your own site. Agree that is the kind of salad i could get to know. As for Downton Abbey – try the new series of Upstairs, Downstairs – miles better!